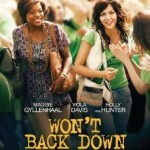 Last night I was pleasantly surprised at how inspirational the movie, “Won’t Back Down” was. 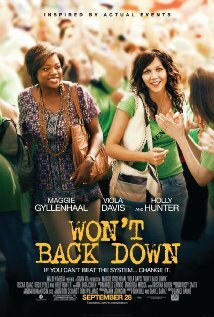 Based on true events, the movie depicts the story of two women (one teacher and one single mom) who take on their local public school in order to transform the culture into one of love, respect and high academic standards. As the movie begins, the audience is quickly drawn into the single mother’s pain and distress as she realizes her daughter’s current class placement is not one that is going to meet her academic or social needs. The other heroine, the teacher, presents as an educator who has lost her passion for her job as she struggles with her crumbling home life and professional dissatisfaction. She has lost all hope. As the two women connect in their dream of a better educational experience for children, we begin to cheer for them as the underdogs who must challenge the status quo of educational bureaucracy which includes a strong teachers’ union and parents who don’t understand the apathy that has enveloped their child’s school. One of the most powerful scenes in the movie is when we see the teacher physically transform her classroom as she begins to psychologically transform herself. The desks go from rows to groups and the monotone “lack of responses” from the students transform into harmonious chants as they share their excitement about learning. At that point, regardless of the outcome of their bid to take over the school, those children in that one classroom and the subsequent classes of that teacher have won, for they will reap the benefits of a passionate educator. One who now remembers why she started in this profession and why she is driven to do what she does. When a teacher is excited about learning and believes that their students are capable (regardless of socio-economic status or learning challenges), then great things happen for both the teacher and the students. That is not only the stuff that movies are made of, but that is a school culture that is possible in every school in every city. There are many things which we can’t control. 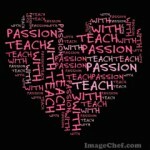 But our attitude and our passion for our chosen profession are two attributes which we are solely responsible for. Yes, it takes hard work and a commitment to make the most of each school day for our students. But, that’s why we chose this profession ~ to make a difference, to not back down when things get challenging, to not back down because we understand the urgency and the power of ensuring that our students feel loved, respected and held to the highest of standards.